Bernard Joseph Josten died peacefully at home on January 17, 2008. He was the first born of ten children of Nicholas and Marie Josten, born on August 16, 1914 at a farm near Herrick, South Dakota. Bernard was educated at Cathedral School and graduated from Cathedral High School and Nettleton College. He began his professional career in accounting working for Dairyland Creamery and Dakota By-Products. He then entered the profession of public accounting, providing accounting and tax services to his clients until he retired in the early 1980's. 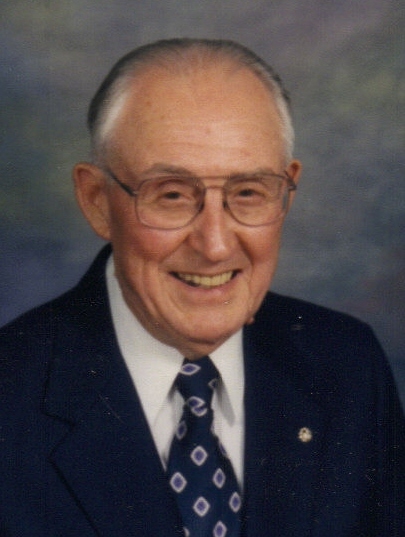 During his many years in public accounting, he worked for the firms of T.J. Morgan and Co.; Broeker Hendrickson and Co.; McGladrey Hendrickson and Co., and Charles Bailly and Co. Bernard was a man of high integrity, and enjoyed lasting relationships with clients he served for many years. A highlight of his career was attaining his professional certification as a certified public accountant. Bernard served the community in many civic organizations, including the Knights of Columbus where he was a charter member of the youth organization, the Squires, and served as Faithful Comptroller of the Fourth Degree Knights for ten years. He was named King of the KC Mardi Gras of the North in 1982. He was also a member of Cosmopolitan International and the Elks Club. He served in the Civilian Conservation Corps in his youth and remained an active member of the "CCC Boys" who continue to meet regularly. Bernard was a member of St Joseph Cathedral parish for 91 years and lived most of his life in the city's North End within a mile of the church. He was firm in his Faith and active in his church. He served as a member of the Parish Finance Council, Lector, and Eucharistic Minister. He and his wife assisted with the Marriage Preparation program for almost a decade. Bernard was united in marriage to Adele Schneider in 1951. Their marriage was blessed with three sons and seven grandchildren. Bernard L. and his wife, Shawna of Dayton, OH; James M. and wife Lynn, of Sioux Falls with children William J. and wife, Kay, Brian Joseph, and Anne; Gregory J. and wife, Bonnie of Rapid City, SD with children, Daniel, Michael, Andrew, and Carolyn. Bernard's passion was his family, especially spending time with his grandchildren. He also enjoyed model railroading, and anything having to do with trains. He loved to read, especially business news, keeping up on his daily Wall Street Journal. While he and Adele were able to be in the family home of over 50 years, he took great pride in caring for their home. In their retirement years, he and Adele enjoyed traveling, especially during the winter months. Bernard was loved as a role model and will be missed by his extended family of brothers, sisters, nieces and nephews. He is survived by his wife, sons and their families. Also by his sister, Sr. Juliann Josten, O.P, Sinsinawa, WI; his brother, Frank( late Irene) Josten, Sioux Falls; three sisters-in-law, Paulette (late William Josten ) Fischer and Barbara (late Joseph) Josten, Sioux Falls, Dorothy (late Nicholas) Josten, Green Valley, AZ and numerous nieces and nephews. He was preceded in death by his mother, Marie (Marx) Josten; his father, Nicholas Jacob Josten; three brothers, Joseph Josten, William Josten, and Nicholas Josten; and four sisters, Madonna (late William) Willard, Rose (late Ray) Norman, Sr. Helen Josten, O.P., and Kathryn Josten. The family requests that memorials may be directed to the Sioux Falls Catholic Schools Tuition Assistance endowment at the following address: Sioux Falls Catholic Schools Foundation 3100 West 41st St. Sioux Falls, SD 57105 Please join the family for a luncheon immediately following the Funeral Mass before they proceed to St. Michael's Cemetery.